The holiday parties are in full swing and when I'm hosting I love to feature dishes that set the mood for the rest of the meal with color, presentation and texture. 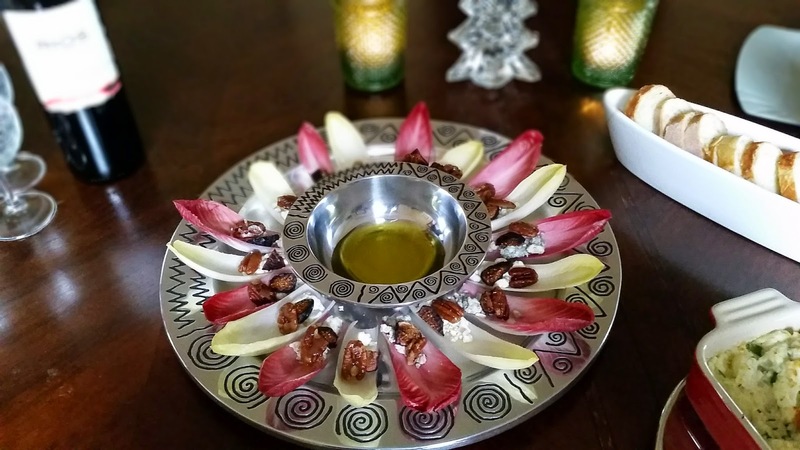 The crisp and slightly sweet taste of California Endives was the perfect versatile element to include in these starters and a fun alternative to the typical crackers or chips. 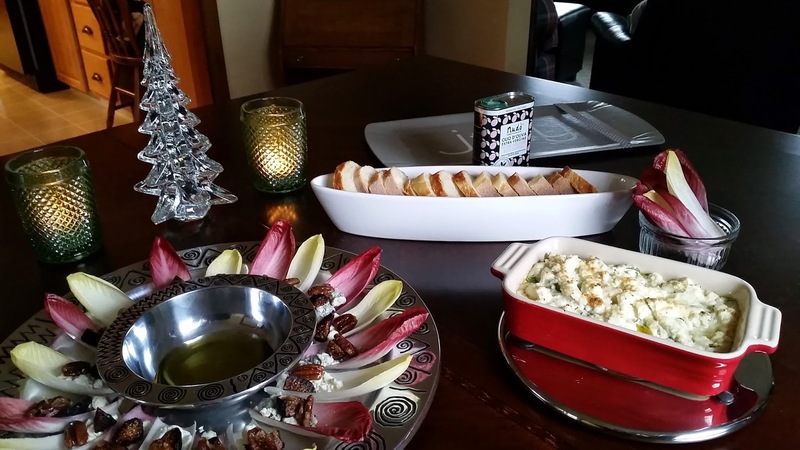 The highlight of my holiday party were these endives with figs, blue cheese and pecans. The crisp endive with the sweet figs and pecans paired extremely well with the strong flavor of blue cheese. We also loved trying this with goat cheese and dipping them in Nudo Italia Olive Oil for an extra level of flavor. Melt the butter in a medium sauté pan over medium heat until the butter starts to slightly foam. Add the pecans, granulated sugar, light brown sugar and maple syrup. Cook, stirring often until all the sugars dissolve and the mixture begins to bubble. Turn the mixture onto a piece of parchment paper and separate them to cool. Trim the bottoms of the endive and separate the leaves. Place a half of the dried fig, 1 teaspoon of blue cheese or goat cheese on each leaf and top with a pecan. 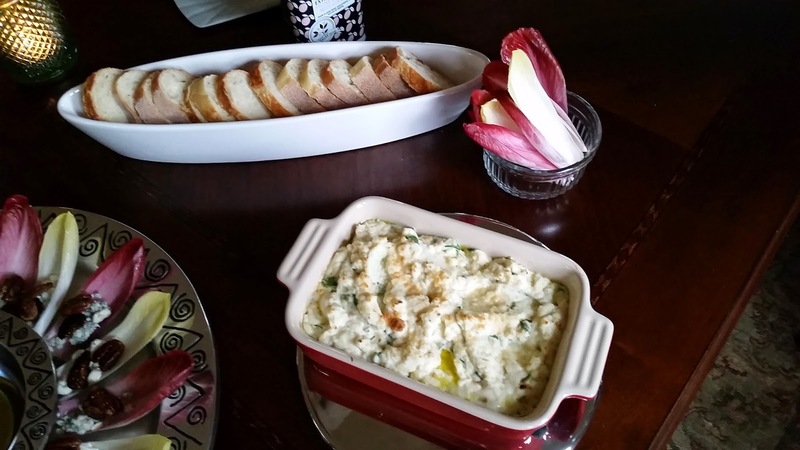 I'm a huge fan of ricotta cheese so I also made this hot ricotta dip using endives. The crushed red pepper gave this dip some great flavor and the garlic olive oil drizzled on top was absolutely delicious. And of course a holiday party isn't complete without the wine so I served Rios de Chile wine from the Cachapoal Valley. Cheers! Heat the broiler. In a medium bowl, mis the ricotta, parsley, dried thyme, red pepper and 1/4 cup of the Parmesan, 1/4 teaspoon salt, 1/8 teaspoon black pepper. Transfer to a shallow, broilerproof backing dish and drizzle with the oil and sprinkle with the remaining 1/2 tablespoon of Parmesan. Broil until the top begins to brown slightly (around 5 minutes) and serve warm with the endive. This post was sponsored by Nudo Italia, California Endive and Rios de Chile , but as always all opinions are my own. Yum!! This looks amazing (and so much fancier than chips and dip)! I love stuffing endive leaves for parties! You've filled these with the perfect mixture for the holidays -- now I need to run to the store and recreate your endive app asap!